Receive a letter from Lady Brisienna. Meet with her and hear her plea. Go to Castle Daggerfall and find the Totem of Tiber Septim in the Treasury. Give the Totem to one of the powers in the Iliac Bay. Receive a message from Nulfaga in your mind. Meet the old sorceress at Castle Shedungent in the Wrothgarian Mountains. A cheerful young woman hands you a letter and then walks away, whistling. of the empire could be at stake. The region where Lady Brisienna's current town is located depends on which of the three required quests you completed as the last. Head to this town and locate the tavern named in the letter. Enter it and speak to her. "(Player's first name), I'm glad you could meet me here. The Blades and your emperor need you again. You may or may not be aware that the Totem of Tiber Septim has been found. For a brief time Lord Woodborne of Wayrest had it. Where he got it from is still a mystery. The Blades mounted an assault upon Woodborne Hall to retrieve it. Although the Hall fell, many of our number fell with it. We sacked the Woodborne Hall, but the Totem was gone. I have reason to believe that Gothryd has the Totem. The Blades no longer have the men to mount an assault on Castle Daggerfall. You have shown yourself to be quite adept at getting in and out of these places. Would you go into Castle Daggerfall and retrieve the Totem of Tiber Septim?" "I knew I could count on you (player's first name). The Totem is most likely in the Daggerfall treasury. It is a huge room, quite unmistakable. I am leaving in a couple of days. I shall send word to you where you can meet me after you get the Totem. Should you succeed, the Emperor has instructed me to gift you with an artifact of great power and renown. Warlock's Ring! If you have read Lord Woodborne's diary, you know that he and Gothryd had been associates for some time due to some common interests. While Brisienna asks you to get the Totem and bring it to her, at the same time five other people are also very interested in gaining possession of it. They are the Underking, Gortwog, King Eadwyre, Queen Akorithi, and the King of Worms. If they like you, they will send you letters promising great rewards if you give them the Totem. If they don't like you, they will send thugs to steal it once you get out of Castle Daggerfall. Go through the southwest door of the throne room and follow the hallway. Head through the door and you will enter a room with an archer. Leave the room through the north door, which will be locked. 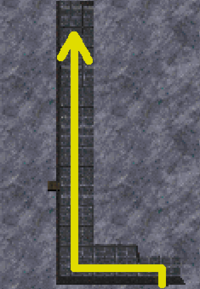 Go through the door in the small room and you will reach a huge room with a central tower and various crossroads. You must reach the top platform of the central tower. The easiest way is to levitate up there, but you can also go up the stairs in the central tower. There will be many archers in this huge room. Once you have reached the top platform, follow the causeway north and exit through the north door. You will find yourself again in a big room. Follow the ledge west and go north past a knight. Go through the east door at the end of the ledge. There will be an enemy in the hallway next to a door. Go through that door and you will be in the treasury vault of Castle Daggerfall. The treasury is a giant cube with 12 chambers hovering in the air and numerous knights and battlemages in the surrounding room. There are many treasures in this cube, and the Totem will also be found in one of its chambers. But first, you must sink it to the ground. To do this, go to the very bottom of this huge room, a square pit filled knee-deep with water and some slaughterfish. At the bottom are two passages at each cardinal direction. The southwest passage leads to a room with a slaughterfish and three chains. Pulling the right chain will cast a water-breathing spell on you. The middle chain will teleport you to a ledge at the top of the vault. The left chain will teleport you also to the top of the vault but in mid-air. Each chain can be used only once. The southeast passage leads to a room flooded with water. There will be an ice atronach and a handwheel in this room. Turning the handwheel will sink the giant cube. However, it will now cover the pit, so you must use one of the chains to get out. Once you are out of the pit, go to the top of the cube. There is a lever in the center; pulling it will lower the blue bars that block entry into some of the treasury's chambers. The totem can be found in the middle chamber of the northwest corner, lying on a pedestal. Pick it up and make your escape. If you haven't set a Recall anchor, you must make your way back through the dungeon and throne room. Beware, as all the throne room guards will now be hostile and engage you on sight. Leave the castle quickly to avoid unnecessary encounters. Note: after you have picked up the Totem, it is advised that you not speak to King Gothryd until you have fully exited the castle (see bugs). "You are (player's name). You are my new host. Know this now and resolutely. You are not worthy to carry the Totem of Tiber Septim. Only those of his blood line may carry me. I will give you a year and a day to accomplish this." The Totem's warning means that only someone of royal blood may wield it; those worthy of this are King Gothryd, Queen Akorithi, King Eadwyre, Gortwog, the Underking, the King of Worms, and Emperor Uriel Septim VII. You have one year and one day to decide who to give the Totem to. Otherwise, it will abandon you for a new owner. Each letter sender promises you a great reward if you present them with the Totem. Decide who is worthy to bear the Totem, it is entirely your decision. Essentially, this decision determines which faction will "win" in the end, so choose wisely. If the quest is still active and your reputation with a specific faction drops below the threshold needed to receive their letter, that individual will send their minions after you to take the Totem by force. This also happens automatically if you exit Castle Daggerfall with the Totem and your reputation is already below the threshold needed to receive the faction's letter. This is permanent; if you raise your reputation with an attacking faction above the letter threshold, they will not stop attacking and you will not receive a letter. A page dressed in the livery of Sentinel hands you a letter, and silently walks away. and I will pay you 100,000 gold pieces. It is a king's ransom by any measure. only regent on the Iliac Bay that can be trusted. The others will only use it to destroy me. "The Totem of Tiber Septim! It is a priceless artifact. I shall guard it well and keep the rebellious powers of Daggerfall and Wayrest in check. Take your reward (player's first name). You have earned it ten fold. You must keep your keen eyes open for the Mantella. Any rumors must be hunted down with vigor. Without the Mantella, the Totem is useless." A portly man bearing the standard of Wayrest approaches you with a letter. His somber expression never changes, and he speaks not a word. He leaves as silently as he arrived. "Fool! Did you really think I would pay you for the Totem? Kill the (player's race)!" The castle guards immediately become hostile, and Eadwyre's battlemages begin appearing to attack you. Make a quick exit. A heavily cloaked figure shuffles toward you. As you prepare to defend yourself, a gnarled green hand shoots forth with a letter. Stunned, you do nothing as the figure shuffles away. the Totem of Tiber Septim. "A nation of Orcs is within my grasp. You have given my people a chance at freedom, (player's name). Should you ever recover the Mantella itself, I shall reward you thrice over for it." "Hand over the Totem, or we'll slaughter you where you stand. Well? Are you going to give it to us, or make us take it from you?" "Then we'll just have to take it." "Coward. Now get lost. Oh yeah. I was told you should go see Nalfuga [sic], whoever that is." "You don't even have it! Now I'm going to kill you just for the fun of it." "I see you have come to your senses. I should have you slain, but I have more honor than that. Instead I shall reward you. Here take 10,000 gold pieces for your turnabout loyalty. Deliver the Mantella to me, and my trust in you will be once again restored." A hand grips your wrist from behind. Spinning, you open your mouth to shout for the guards. A skeletal hand stuffs a letter into your mouth. The heavily robed skeleton releases your wrist and turns away, unnoticed by other passerby. mortal stature are filled with pride and greed. destroy the very thing they covet. the Totem and I will safeguard the world. reputation throughout Tamriel will soar. "The Totem! At last it is within my grasp. You have done well, (player's first name). I shall remember this when I have transformed. Search now for the Mantella. Without it, the Totem is worthless. In the mean time, enjoy the adoration of the world." For information on this reward, see the chart below. A letter floats through the air toward you. Strangely, nobody else seems to notice it. The letter tucks inself [sic] into your pack. me, and to none other. in exchange for the Totem. (regional temple) of (region), at (temple). "The Underking will be most pleased. He has searched many life times for this lost item. I have been instructed to give you this object. Use it wisely. Should you ever locate the Mantella, the Underking would be most appreciative." Bring the Totem there as soon as possible. "Your Emperor will be most grateful. The Totem could have started a civil war in the wrong hands. Thank you (player's first name). Now you must away to Nulfaga. She holds the key to the Mantella. Free the Mantella, and the Emperor controls Great Numidium through the Totem." Eadwyre: Promises gold, but instead sends his battlemages after you. Gortwog: It was originally intended that he give you the Warlock's Ring; as of the latest official patch the reward is the Chrysamere. However, due to a bug you will get nothing regardless of which version is installed (see bugs). King of Worms: Fame. However, this does not work and you receive nothing (see bugs). The unmistakable voice of Nulfaga speaks softly in your head, "I see that the Totem has found its way into the hands of someone with royal blood. I think it is time you paid me another visit here in Shedungent (player's name). Your work is not yet done." Prepare yourself and head to Castle Shedungent, where Nulfaga waits to send you off on the final part of the Main Quest. If you give the Totem to the King of Worms, you are supposed to get a lot of reputation. For details, see the table below. Note: due to a bug in the questfile, these reputation gains will not be awarded. See bugs for a third-party patch which corrects this error. The Daggerfall Chronicles refers to this quest as "Totem, Totem, Who Gets the Totem?". If you present the Totem to Gortwog, it was originally intended that he reward you with the Warlock's Ring. As of the latest patch (v1.07.213), he should now give you the Chrysamere instead. However, the specific command to give you either artifact is missing from the questfile and in the end you get nothing from him. DFQFIX addresses this bug; Gortwog will properly award you the Chrysamere. Due to a bug in the game engine you cannot complete the quest if you give the Totem to Gothryd or his men. Doing so causes a game-breaking situation at the end of the final quest, leaving you stuck and unable to complete it at all. DFQFIX addresses this bug; you can now give the Totem to Gothryd or his men without issue. Occasionally, if you give the Totem to Gothryd or his knights, Nulfaga's dialogue fails to appear. Since the appearance of this dialogue is necessary to trigger the next (and final) quest, this is also game-breaking bug. The latest release of DFQFIX corrects this bug; you can now give the Totem to Gothryd or his men without this consequence. The fame the King of Worms promises is not actually given. Installing DFQFIX will allow you to receive this reward as intended. Any payment you may get from Queen Akorithi or King Gothryd goes directly into your inventory and is not given to you via a menu screen. To add these payments to your wallet, you must first drop them on the ground or into your wagon, then pick them up again from there. Picking up the piles of gold directly from your inventory will cause them to vanish permanently. Since you can never carry 100,000 gold even with 100 strength, you may want to wait until you are in a bank before doing this with Queen Akorithi's reward. The journal entry that should appear when you accept Lady Brisienna's mission may be missing. DFQFIX restores this missing entry, and also adds a notification when you have received her second letter. If you refuse Lady Brisienna's request to get the Totem, the quest will remain active forever even though it is now impossible to embark upon it. DFQFIX addresses this; if you refuse the quest, it will now end. 0 (Date): Lady Brisienna has asked me to bring her the Totem of Tiber Septim. It is hidden in the treasury of Castle Daggerfall. She fears that assassins are after her, and will send me a letter revealing her current whereabouts when I escape the castle. Whoever holds the Totem has the potential to control mighty Numidium and forge a new empire, just like Tiber Septim did so long ago. 1 (Date): The Totem of Tiber Septim spoke to me in my head! It claims that only those with royal blood can lay claim to the Totem. It has given me one year and one day to decide who shall be its true wielder. This page was last modified on 5 April 2019, at 04:28.